North Street Portslade: Station Road end. Comment has been made here about various shops in North Street Portslade. Mention was made of Silverthorne’s fish and chip shop. At one time Lower Portslade could boast about four good fish and chip shops. As well as Silverthorne’s, there was Cave’s in North St, Ford’s in Station Road, and one I cannot remember the name of, in Church Rd. Back before 1929 there was a little fish and chip shop at the bottom of North Street, next to the old Pavilion picture house, run by a man named Peters. Sadly this was all demolished circa 1930 when the new Pavilion was built. I knew them all as when they were open we used to trek between them all asking for the crackling. How many of you can remember the story of the chap who kept a junk shop on the corner of Clarence Street? His shop had a bit of a reputation for being a place where us youngsters did not loiter around, but passed it by very quickly or even crossed the road to avoid it. Very few people ever saw the owner; nobody seemed to like going in the shop as if it was haunted or something. One night he met a very sticky end – murdered in his shop. Two local men were soon picked up for it, stood trial, found guilty and sentenced to be hung. Now one of these men was very young and had started life in the East Street area and got in with bad company. Efforts were made to commute the sentence to imprisonment but it all fell on deaf ears and he was hung. Yes the law was tough in those days. As I pointed out on another page of this site regarding North Street; this photograph was in fact taken looking towards Station Road, from just above Middle Street, i.e. about three-quarters of the way down North Street. The photographer was standing on the north side of the road and the old Baptist Church would have been behind him. The slope of the road gives it away, even without the shops on the other side. I spent the first ten months of my life living in a flat above number 57 North Street which is just behind the group of ladies standing chatting on the pavement; more or less where the lamp post is. I would say the photograph is from around 1915-20 by the style of clothes and the pram. Clearly, even Francis Frith got his notation wrong sometimes. Not so much about the page just about Eric Masters. Did he have a transport business once doing contract work for Fryco? As of the early 1960s the fish and chip shop in Church Road, Portslade, was called Supreme Fisheries. It was at number 22, and was owned by Ray Bundy. Out of interest can anyone tell me what happened to North Street? it seemed to be a street that was thriving with small businesses? and none of that survives now. After the war the process of demolishing the shops and houses in Portslade by Sea and moving everyone up to Mile Oak went on apace; the pollution caused by the gasworks, Brighton A&B power stations, sawmills, shipping and the general dockside industry was deemed unsuitable. Curiously across the border in Fishersgate demolition also took place but rehousing was on the same site! 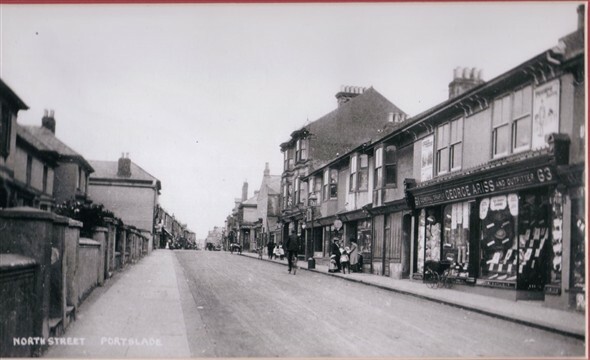 In fact, shops in North Street began closing down in the late 1950s and housing in the surrounding roads was pretty well all gone by the early 1960s. The people were mostly rehoused in Mile Oak, as Geoffrey says. I don’t recall any part of Fishersgate suffering a similar fate, however. Southwick yes, but not Fishersgate. Areas of Southwick, mostly just to the north of the coast road, were demolished and the people were rehoused within Southwick. The prefab bungalows just to the south of Manor Hall Road were also demolished in the early 1960’s with those people also being rehoused in Southwick. In response to Claire’s comment [25/02/2018] I can confirm that the Council’s demolition process started as early as the late 1950’s as Alan states above. I lived at number 53, and indeed there were lots of small businesses. My house was the last two storey house on the right in the photo before the three storey houses started. My mother owned a Confectioner and Tobacconist shop. Next door, up the road was 51 where Nora Robinson ran a Draper’s shop. This three storey building was owned by Mr and Mrs Imrie with their 2 daughters. They were expats. Mrs Imrie worked in the Box Office at the Ice Rink stadium and I loved watching Brighton Tigers as a child – particularly as the tickets were free! Down from us in the 1950’s at 55 was a carpet shop owned by Mr and Mrs Judge, a Jewish couple, who let us share their TV – the only one around – when the Coronation took place on 2nd June 1953 – the first time we’d seen TV. Next to them at 57 lived a fairly elderly couple, Mr and Mrs Ware, with their son, Alan, and they ran a greengrocer’s shop but closed in the late 50’s because I don’t believe they could compete with Gobel’s shop at the top of the road. Down from them was a shop which sold pet food owned by Mrs Sweet with her 2 small boys and beyond that the Post Office run by Mr and Mrs Cable, whose son, Jimmy, helped them. Next, and on the corner, was a cafe but I know little about the owners. Opposite us were private houses but above them, on the left in the photo, in the first double storey building extending right out to the pavement on both floors was a Tool shop rented by Mr and Mrs Fuller who commuted each day from Hangleton – as indeed did Nora Robinson [above] to her Draper’s shop. Next to Fuller’s – and up the street – was George Dowsett’s the Bookmakers. He was friendly with Flanagan and Allen, as well as Dora Bryan, who used to visit the shop. “Monsewer” Eddie Gray, a member of the Crazy Gang, patronised my mother’s shop and I can remember coming home from primary school one day to hear a sound coming from within our shop. It was Flanagan and Allen singing ‘Underneath the Arches” for my mother. There were a whole range of shops and services higher up the street including a good butchers and “Home & Colonial” where you could get almost any grocery product. They were one of the forerunners of today’s supermarkets although they closed – I think in the late 1950’s/early 1960’s as the council’s desire to industrialise North Street accelerated. Factories such as “Flexer’s Sack Factory” were established and expanded. Pubs such as The Clarence” struggled to find customers. Householders and shopkeepers such as my mother tried to hang on and fight against the wave of Compulsory Purchase Orders. The more they succeeded the lower the value of their property became as Industry took over but the North Street Community had been permanently destroyed. My mother was one of the last to leave – if not the last – and she finally succumbed on 24th March 1976. So although the process started in the 1950’s, it wasn’t until over 30 years after the War that it was completed.